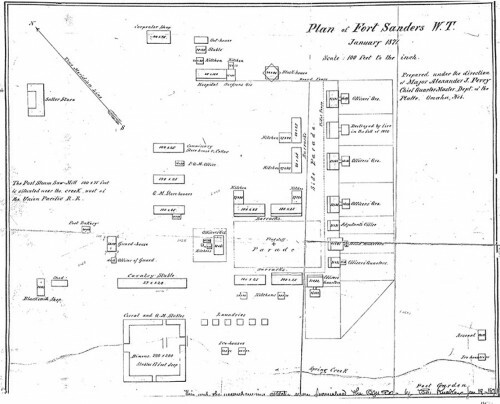 This diagram of Fort Sanders as it stood in 1871 shows the buildings, creek, stables and parade grounds. It was prepared under the direction of Major Alexander Perry, Chief Quartermaster, Department of the Platte, Omaha, Nebraska. The Department of the Platte had jurisdiction over Wyoming Territory. At one time 600 soldiers were housed at Fort Sanders, but numbers dropped due to fear of attacks. The military reservation covered 81 square acres of southeastern Wyoming in its heyday. The fort grounds were 223 feet (68 m) by 400 feet (122 m), including a parade ground. The post was originally built for four companies, but was later expanded to accommodate six. Nearly all of the buildings were constructed of wood except for the stone guardhouse, which was built in 1869 and remains the only structure standing today. Very little remains of the settlement which was decommissioned in 1882. The post Commander’s quarters were moved to LaBonte Park in Laramie and have been used as a community center and pre-school for decades. 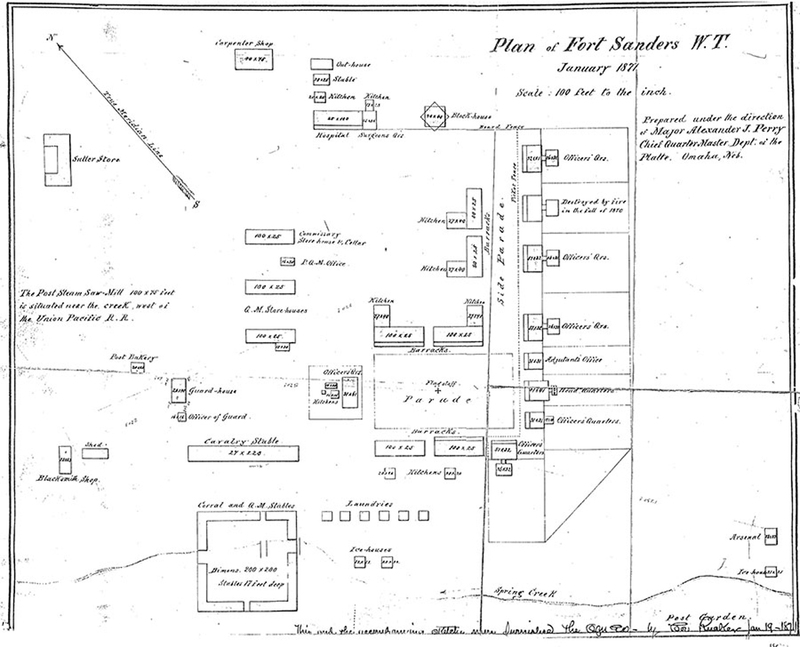 The garrison at Fort Sanders frequently protected railroad crews from attack all along the rail line from the Laramie Range and across the plains. Initially, Fort Sanders was the county seat for the original Laramie County (as created by the Dakota Territory), which was almost all of what later became the Wyoming Territory. On Jan. 3, 1868, Dakota lawmakers moved the Laramie County seat to Cheyenne and created a new Carter County out of the western half. Learn more about the history of Fort Sanders and the building of the Transcontinental Railroad.